Become an Overland Business Partner – It’s Good for the Community and Good for Business! Northern Front Range businesses can now partner with Overland Mountain Bike Association, a federally registered 501(c)3 non-profit organization, to help make the region a better place for all soft-surface trail users. By supporting Overland in our effort to improve the community, your business or organization can benefit as well. Overland has numerous partnership opportunities for businesses looking to give back to the community and elevate their brand. 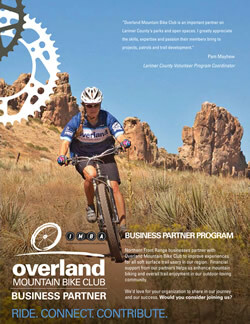 If you would like to become a Partner or learn more about our Business Partner Program, please contact us at bpp@overlandmtb.org. Join with our current business partners to support our organization and all the good works we do in the region. Custom – $5,000 – Titanium level benefits, plus: Sponsorship of an OMBA signature event of choice. Partnership level can be achieved with a combination of cash and in-kind donations, with a $1000 minimum cash donation. Carbon – $2,500 – Titanium level benefits, plus: Sponsorship of an OMBA standard event of choice or an OMBA signature event (to be determined by OMBA). Partnership level can be achieved with a combination of cash and in-kind donations, with a $1000 minimum cash donation. Titanium – $1,000 – Aluminum level benefits, plus: Business Logo and website link on every newsletter. Sponsorship of an OMBA standard event (to be determined by OMBA). Partnership level can be achieved with a combination of cash and in-kind donations, with a $500 minimum cash donation. Aluminium – $500 – Steel level benefits, plus: Business Logo and website link on quarterly newsletters. Sponsorship of an OMBA standard event (to be determined by OMBA). Partnership level can be achieved with a combination of cash and in-kind donations, with a $250 minimum cash donation. Newsletter mention of joining/renewal. Official Partner of OMBA sticker/poster/window display for place of business. *OMBA signature events include Season Kickoff Party, Season Finale, Take a Kid Mountain Biking Days, Curt Gowdy Club Campout, Trail Talks series. Event sponsorships include business mention in all event media releases and at the event. Business logo and link is included on Partners page of OMBA website for all levels. Inclusion in Partner Program extends for 1-year from date of agreement.